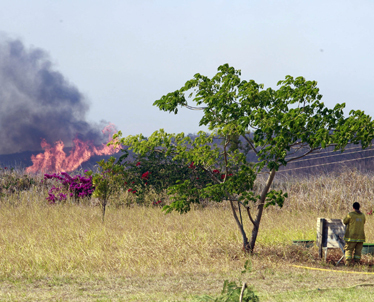 A brush fire closed in on a residential area on Poamoho Street in Haleiwa yesterday. Smoke from the huge blaze was visible from miles away. A brush fire that consumed more than 1,500 acres closed roads and forced the evacuation of at least two housing areas on the North Shore yesterday. Thick plumes of smoke from the fire south of Weed Circle were visible for miles. At least 20 Honolulu Fire Department units as well as federal firefighters were called in to fight the blaze, which forced the evacuation of houses on Poamoho Street and the old Otake Camp plantation homes. 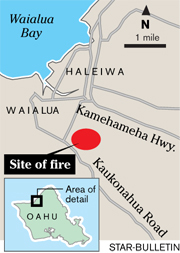 Portions of Kamehameha Highway, Kaukonahua Road and Farrington Highway were closed to traffic as a result of the fire. Hawaiian Electric Co. shut down power to about 1,130 customers in the area. The Hawaii chapter of the American Red Cross opened up a shelter at Waialua District Park community center but moved it to Whitmore Community Park at about 8 p.m. after power went out. 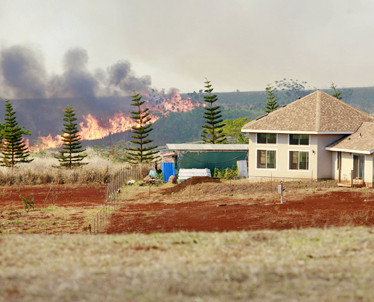 A firefighter kept watch yesterday on the brush fire closing in on a residential area on Poamoho Street in Haleiwa. Residents were instructed to evacuate the area. About 45 firefighters fought a 1,500-acre fire near Waialua yesterday that forced the evacuation of about 50 residents and forced power outages to more than 1,000 customers. Firefighters had prevented the fire from threatening structures and allowed the residents back into their homes at about 9:30 p.m. While two fire helicopters ceased water drops after dark, about 20 fire companies and six federal fire companies continued to fight the fire. "We're going to be here overnight," said Honolulu Fire Capt. Terry Seelig. "We're going to have to reassess when it gets light." The fire started at about 2:30 p.m. off Kamehameha Highway near the road to Helemano Military Reservation, firefighters said. It spread westward toward Kaukonahua Road and grew to about 700 acres by 4:30 p.m., forcing firefighters to close off Kaukonahua Road. Several residents in the area were evacuated. During the battle, firefighters struggled with strong wind that pushed the fire into difficult-to-reach areas. At one point the fire jumped Kaukonahua Road and began burning in a gulch area. 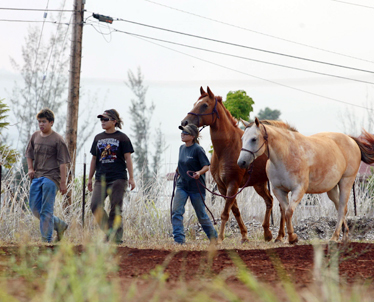 Justin Kirito and his sisters, Joselyn and Ashley, evacuated horses from a pasture in Haleiwa. Firefighters were able to contain the fire near residential homes by Hukilau Loop and Otake Camp. "We were requested by the Fire Department to de-energize our power lines out there," said HECO spokeswoman Janet Crawford. At 4:56 p.m., HECO cut power to the 46-kilovolt and 12-kilovolt lines, affecting customers mostly in Waialua and on Kamehameha and Farrington highways. At 8:19 p.m., HECO re-energized the circuits and restored power to all the customers in the area. Crawford said she did not know if any equipment had been damaged by the fire. Seelig said power lines also were down by Thomson Corner. Firefighters asked police to close off Kaukonahua Road from Weed Circle to Thomson Corner. "It's dark, so it's harder to see the terrain," Seelig said. The fire, he said, "is still in areas that are uneven and steep. The wind has died down a little bit, but it's still going." The Hawaii chapter of the American Red Cross opened up a shelter at Waialua District Park community center but moved it to Whitmore Community Park at about 8 p.m. after the power went out. About 25 adults and children were at the Waialua shelter, but no one showed up at the Whitmore shelter, said Lynda James, Red Cross disaster assistance team captain. She did not expect anyone to arrive at the second shelter because officials had started allowing people back into their homes. Officials planned to close the second shelter at 10 p.m. if no one showed up, James said. Firefighters still were determining the cause of the fire last night. » 7 Wonders: What's wonderful to you?